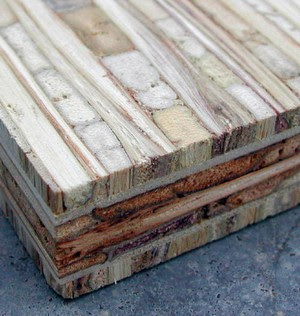 This is Kirei, a plywood product from the innovating geniuses at Smith and Fong. Kirei is made from the usually discarded stems of sorghum. That stuff is usually called straw when it has a use and waste when it doesn't have a use. Sorghum is a grain and the seeds are made into a sweetener that's usually referred to as sorghum molasses. Sorghum molasses' popularity has waned significantly in the US, but it's still a widely cultivated crop in other parts of the world. When it's converted to ethanol, it has a higher yield per pound when compared than corn so there is a growing interested in sorghum cultivation in the US. Anyhow, Smith and Fong figured out how to make a decorative and structural ply product with the straw that's left over from Sorghum processing and it's really neat-looking stuff. 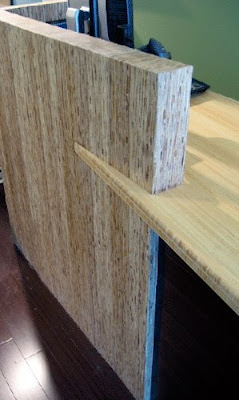 The desk below is made from Kirei and bamboo plywood. What results is a beautiful, functional and sustainable office desk. Neat! Where is it available? Why, at Indigo of course.